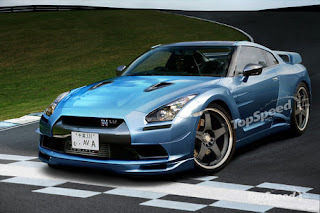 Top Speed has released a rendering of what they expect the GT-R LM to look like. The speculation is for 600 hp and only 30 units to be produced. Its fairly unlikely for Nissan to produce a car like this. Nismo however might produce something like this on a limited basis, like the R34 GT-R Z-Tune, but it wouldn't make a lot of sense for Nissan to produce a limited run of 30 cars. The price on a limited to 30 cars run,if the SpecV is $165,000 would be way into Ferrari territory. Did someone mention a rear wheel drive version ? Like the R33 GT-R's that ran at LeMans ? V8's like the Super GT cars ? A larger version of the VR38DETT ?